Paid search advertising is great because you can pay to rank well on the search engine results pages (SERPs) for your target keywords. But, it can be frustrating when you’re spending a lot of money on campaigns and your ad ranking isn’t what you want it to be. Want that top spot? We can help you get there. In this post, you’ll learn all about ad ranking, including the factors that determine it and several ways you can improve your ad ranking almost instantly. Ad ranking is the position in which your pay-per-click ad is displayed in search results. Essentially, ad ranking is what determines whether your ad shows up first or fifth. Not surprisingly, ads that have higher ad rankings may have an edge over the ones displayed below it. You’ll get more visibility, which can directly result in higher click-through rates (CTR). Relevance of the keywords you’re targeting. If one of your targeted keywords is an exact match to the user’s search query, your ad rank will improve. If, however, it’s an almost-match utilizing the broad-match keyword type, it may be a little lower down. Relevance of ad text and landing pages. 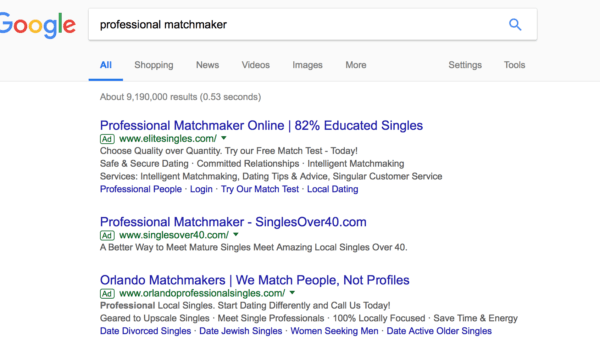 It’s not just about the keywords (though they certainly matter)—Google will also do what they can to make sure your ad text matches the searches, too. Quality score, which is Google’s evaluation of the quality and relevance of your ad to the audience you’re showing it to. Factors like CTR and past performance are taken into account. Bid. It’s all about the money, baby. Or at least, all else being equal, the higher ad placement will go to the higher bid. That being said, an ad with a lower bid and a higher quality score can actually outrank an ad with a higher bid. Want to shoot for that number one spot? There are a few ways that you can improve your ad ranking very, very quickly. Most (but not all) will involve making simple changes that can help to increase your quality score as fast as possible, as that’s an enormous factor in what position your ads are given. Bet you saw that one coming. I know this one isn’t always a favorite thing to hear from those on a tight budget, but because it’s the quickest and fastest way to improve ad ranking we have to talk about it. If you increase your bid, there’s a good chance that you’ll move up in the ad ranking and land that primo spot. If you are on a tight budget, you can choose to bid more only on certain high value keywords (like the ones that drive conversions for premium products) by putting them into their own campaign. This allows you to pay more only for the keywords that are most important to you. 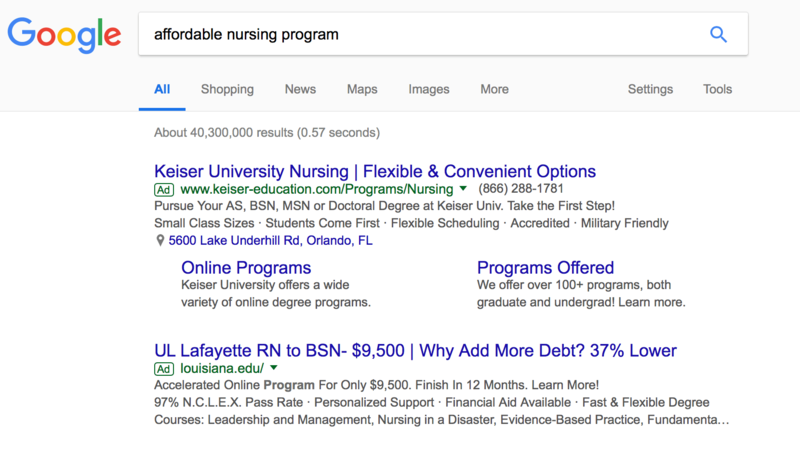 Specificity and a niche-approach can mean that your ads are more relevant to the small subsection of your audience and keyword groups that you’re targeting. This will mean more accurate ad placements, which means more clicks. Both will lead to an increased ad ranking. 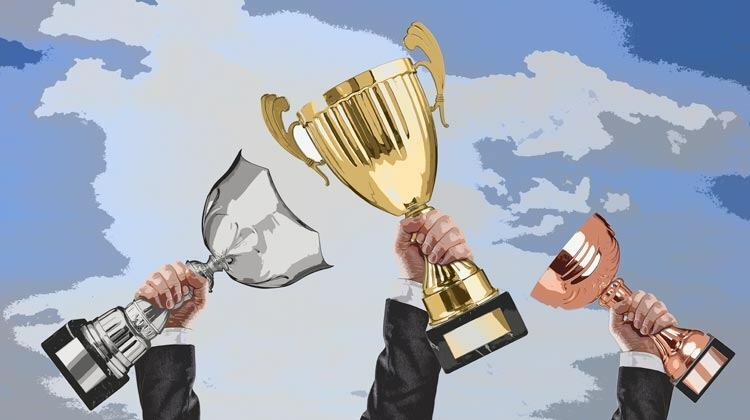 This strategy to improve your ad ranking will take a bit of time, but you need to go through your paid search campaigns and do some revamping. Focus on creating ads for specific buyer personas, running campaigns for different products, services or use cases. Eliminate irrelevant keywords and tailor your ad copy to those very specific ad groups. Utilize negative keywords to eliminate irrelevant placements and your ad placements will improve quickly. Your ad rank will follow. Several of these ads are intended to be seen by different audiences. 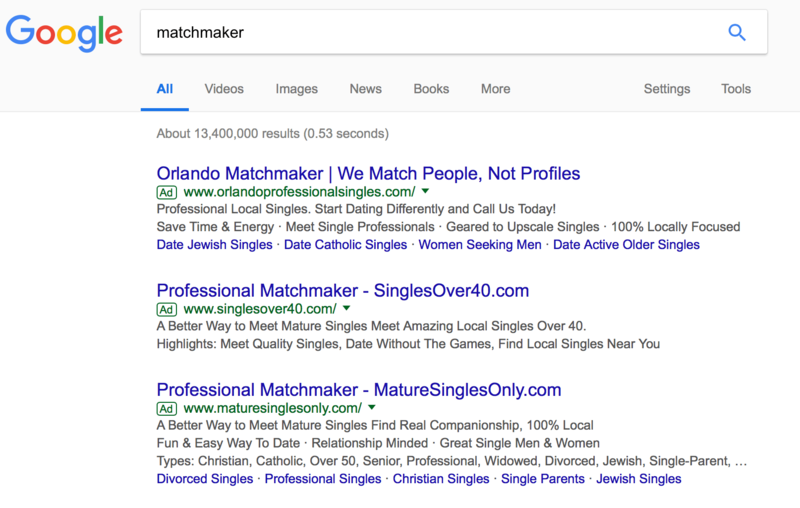 The first focuses on matching “professional” and “educated” singles, while the second is for “mature singles over 40.” These ads are both specific about who they can help, but the first result went up in ad ranking for the search “professional matchmaker,” when they didn’t even show up in the search for just “matchmaker,” as seen below. This is a great example of the power of specificity in paid search advertising. Your ad position isn’t the only thing that can get users to click and, ironically, your ad ranking may only increase if you can get users to click at a lower ranking in the first place. Finding ways to increase clicks can increase your quality score and boost your ad ranking. One of the best ways to do this is by highlighting specific features and benefits. The ads above both list distinct features of their programs that can benefit users, like “Finish in 12 months,” “Small class sizes,” “flexible scheduling,” and “financial aid available.” These ads will appeal to people looking to programs that are affordable and that they can finish quickly, perhaps while working around another job or taking care of a family, getting them more clicks and improving their ad rank. Google doesn’t just look at the ad you’ve created, they also take a close look at your landing pages. Because of this, you can improve your ad rank if you have different landing pages that you utilize for different products and use cases instead of just sending all ad traffic to the same one. To save some time, you can use landing page creation tools like Unbounce (pictured above) that can speed up the page creation process and make it easier to both create specified landing pages and split test them. Increasing your ad ranking may seem difficult, but these easy adjustments can help you improve your ad rank as quickly and affordably as possible. This, in turn, will increase the visibility and click-through rates of your ads, getting you more results from the same number of searches. Struggling to improve the ad ranking on your own campaigns? Get in touch with us and see how we can help you get the results you’re looking for. What do you think? How do you improve your ad ranking on Google AdWords? Which strategies have worked for you? Let us know in the comments below! Hello, I have few keywords with lots of impressions and less clicks. My Competitor is just on 1st position always for that keyword. how should i reach on 1 st Position – QS is 7 on all of my keywords. Please suggest. Hi I’m an artist, mainly a commissioned portrait painter but also art tutor and demonstrator and i’ve just signed up with yell this morning improve my google ranking/seo. via Yell or just do a google search, i know i would search via google. My ad position in below 3.6. I am working hard to improve my ad position. In Auction insight no competitor result showing. What to do? Good helpful tips. Thank you for sharing.